A very impressive offering of a highly elusive issue. 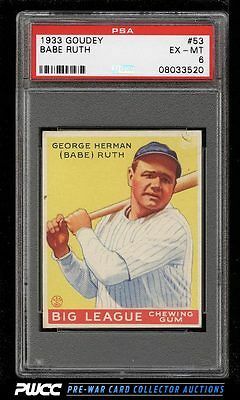 Almost never does the #53 Ruth surface in grades higher than VG with the offered PSA 6 representing the highest graded PSA copy we've brokered in years. A well framed example with great color and focus and four square corners. Very minor wear at the extreme tips and a small area of surface wear in the upper right corner region prevent a higher technical assessment. An all-around stunning investment piece, worthy of the finest collection. One of nearly 20,000 cards, lots, and sets up for bid in our 7th Auction of 2016. Click on the link above to view the other PWCC auction lots.